This article is about house types by form or structure. For house types by decoration or appearance, see List of house styles. This is a list of house types. Houses can be built in a large variety of configurations. A basic division is between free-standing or single-family detached homes and various types of attached or multi-family residential dwellings. 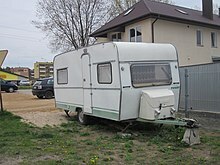 Both may vary greatly in scale and amount of accommodation provided. A Hut is a primitive dwelling, usually one room and one story in height. The design and materials of huts vary widely around the world. 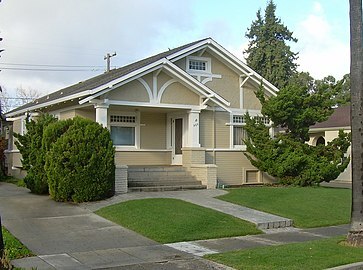 Bungalow is a common term applied to a low one story house with a shallow-pitched roof (in some locations, dormered varieties are referred to as 1.5-story, such as the chalet bungalow in the United Kingdom). 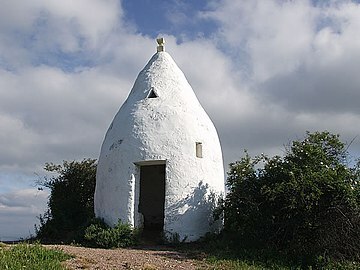 A Cottage is a small house, usually one story in height, although the term is sometimes applied to larger structures. An I-house is a two-story house that is one room deep with a double-pen, hall-parlor, central-hall or saddlebag layout. A Gablefront house (or a Gablefront cottage) has a gable roof that faces its street or avenue, is in the novel The House of Seven Gables. A-frame: so-called because the steep roofline, reaching to or near the ground, makes the gable ends resemble a capital letter A.
Charleston single house: originating in Charleston, South Carolina, a narrow house with its shoulder to the street and front door on the side. 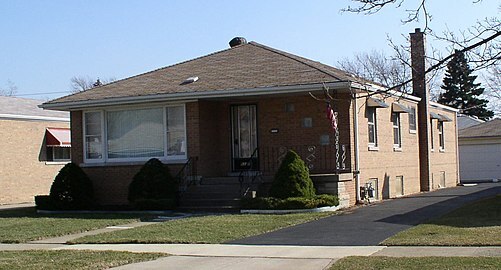 Split-level house is a design of house that was commonly built during the 1950s and 1960s. It has two nearly equal sections that are located on two different levels, with a short stairway in the corridor connecting them. 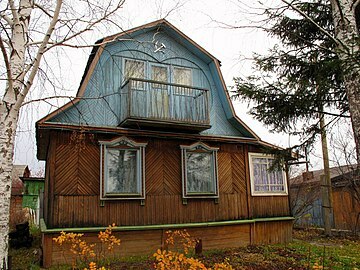 A Tower house is a compact two-story house, often fortified. 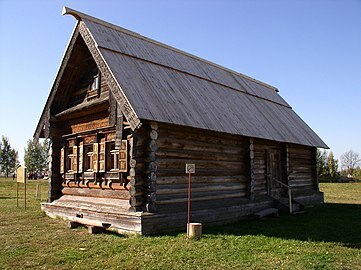 A Longhouse is historical house type typically for family groups. A Housebarn is a combined house and barn. Frutighaus: a type of barnhouse originating in the Frutigland region of Switzerland. 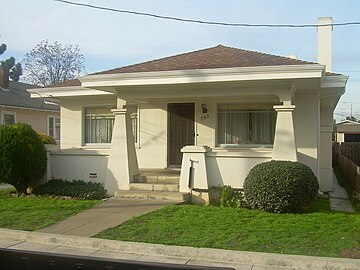 Snout house: a house with the garage door being the closest part of the dwelling to the street. 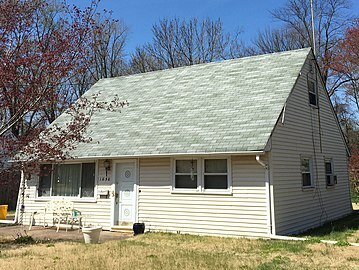 Airey house: a type of low-cost house that was developed in the United Kingdom during in the 1940s by Sir Edwin Airey, and then widely constructed between 1945 and 1960 to provide housing for soldiers, sailors, and airmen who had returned home from World War II. These are recognizable by their precast concrete columns and by their walls made of precast "ship-lap" concrete panels. 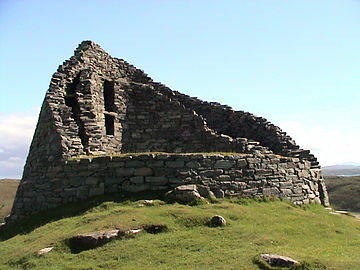 Castle: primarily a defensive structure/dwelling built during the Dark Ages and the Middle Ages, and also during the 18th century and the 19th century. Converted barn: an old barn converted into a house or other use. 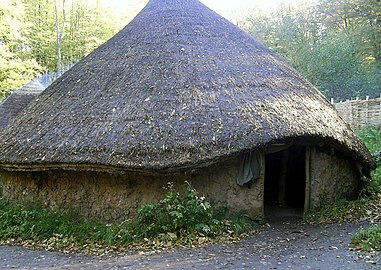 Pit-house: a prehistoric house type used on many continents and of many styles, partially sunken into the ground. Souterrain: an earthen dwelling typically deriving from Neolithic Age or Bronze Age times. 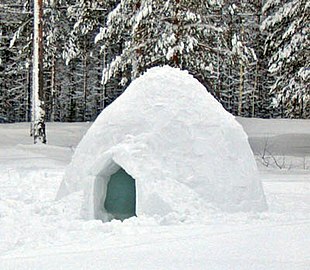 Igloo: an Inuit, Yup'ik, and Aleut seasonal or emergency shelter that was made of knife-sliced blocks of packed snow and/or ice in the Arctic regions of Alaska, Canada, Greenland, and Siberian Russia. Kit house: a type of pre-fabricated house made of pre-cut, numbered pieces of lumber. Sears Catalog Home: an owner-built "kit" houses that were sold by the Sears, Roebuck and Co. corporation via catalog orders from 1906 to 1940. Pole house: a timber house in which a set of vertical poles carry the load of all of its suspended floors and roof, allowing all of its walls to be non-load-bearing. Prefabricated house: a house whose main structural sections were manufactured in a factory, and then transported to their final building site to be assembled upon a concrete foundation, which had to be poured locally. Manufactured house: a prefabricated house that is assembled on the permanent site on which it will sit. Stilt houses or Pile dwellings: houses raised on stilts over the surface of the soil or a body of water. Tree house: a house built among the branches or around the trunk of one or more mature trees and does not rest on the ground. Mews property: an urban stable-block that has often been converted into residential properties. The houses may have been converted into ground floor garages with a small flat above which used to house the ostler or just a garage with no living quarters. Chattel house: a small wooden house occupied by working-class people on Barbados. Originally relocatable; personal chattel (property) rather than fixed real property. ^ Harris 2006, p. 892, Single-pile house: A house that is only one room deep"
^ Cloues 2005, Single Pen: "A one-room house, usually gable-roofed with an end chimney"; Harris 2006, p. 490, Hall: "4. A small, relatively primitive dwelling having a one-room plan." ^ Cloues 2005, Double Pen: "A two-room house with two front doors, usually gable-roofed with end chimneys"
^ Cloues 2005, Saddlebag: "A two-room house with a central chimney and one or two front doors, usually gable-roofed"
^ Cloues 2005, Hall-Parlor: "A two-room house with unequal-sized rooms and one front door, usually gable-roofed"
^ Cloues 2005, Central Hallway: "A two-room house with a central hall and centered front door, usually gable-roofed with end chimneys"
^ Cloues 2005, Dogtrot: "A two-room house with an open center passage"
^ Harris 2006, p. 328, Double-pile house: A house that is two rooms deep"
^ Cloues 2005, Shotgun: "A one-room wide house, two or more rooms deep, without a hallway; gable- or hip-roofed"
^ Harris 2006, pp. 887–888, Side-hall plan, side passage plan: "A floor plan of a house having a corridor that runs from the front to the back of the house along one exterior wall; all rooms are located on the same side of the corridor." 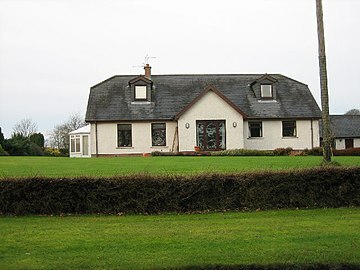 ^ Cloues 2005, Bungalow: "A house relatively long and low in proportion, rectangular in plan, with an irregular interior floor plan, featuring integral porches and low-pitched roofs"
^ Cloues, Ranch House: "A house with long, low proportions and extended rectangular plan, sometimes with L- or T-shaped extensions at one or both ends, rooms clustered with family living spaces at one end and bedrooms at the other end, often with integral carport or garage; low gabled or hipped roof"; Poore 2018; Salant 2006. ^ a b c Poore 2018; Salant 2006. ^ Cloues 2005, I-House: "A one-room-deep house with a distinctive tall, narrow profile; floor plans include central hallway, hall-parlor, double-pen, and saddlebag; often with rear shed or porch"
^ a b c Nostrand 2018, pp. 102–104. ^ a b McAlester 2013, pp. 613–614. Cloues, Richard (2005-03-26). "House Types". New Georgia Encyclopedia (2013-08-22 ed.). Georgia Humanities and the University of Georgia Press. Retrieved 2018-12-28. Harris, Cyril M. (2006). Dictionary of Architectures & Construction (4th ed.). NY: McGraw-Hill. ISBN 0-07-158901-5. McAlester, Virginia; McAlester, Arcie Lee (2013). A Field Guide to American Houses: The Definitive Guide to Identifying and Understanding America's Domestic Architecture. Alfred A. Knopf. ISBN 9781400043590. Nostrand, Richard L. (2018-01-19). The Making of America's Culture Regions. Rowman & Littlefield. ISBN 9781538103975. Poore, Patricia (2018-06-05). "The California Ranch". Old House Journal Magazine. Archived from the original on 2012-12-31. Retrieved 2019-01-01. Salant, Katherine (2006-12-30). "The Ranch, an Architectural Archetype Forged on the Frontier". The Washington Post. Archived from the original on 2012-12-31. Retrieved 2012-12-31.